1. 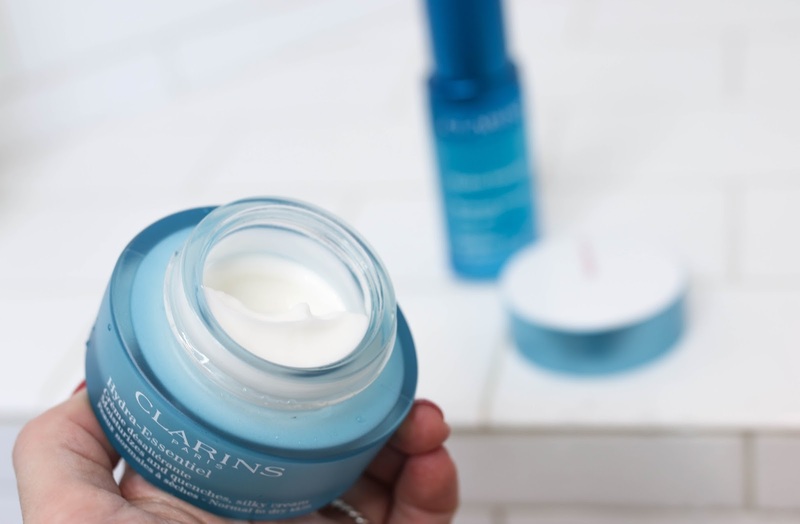 Clarins Hydra-Essentiel Moisturizer - Initially when I opened this jar, I thought it was going to be another lightweight gel cream based on it's intense hydrating claims. However, the texture really surprised me since it is much thicker than I anticipated and feels like a traditional cream. While I was waiting for it to absorb (thinking it would take a few minutes), I felt my skin 25-30 seconds after applying and it had already disappeared into the skin. To say this cream is comforting is an understatement. The texture has a slip to it that doesn't make it feel greasy, and it feels as if it is enveloping the skin making it feel nourished and hydrated. I prefer to use it at night and love how pampering it feels to apply - my skin feels instantly comforted which is essential when I've been in and out of the cold all day. 2. 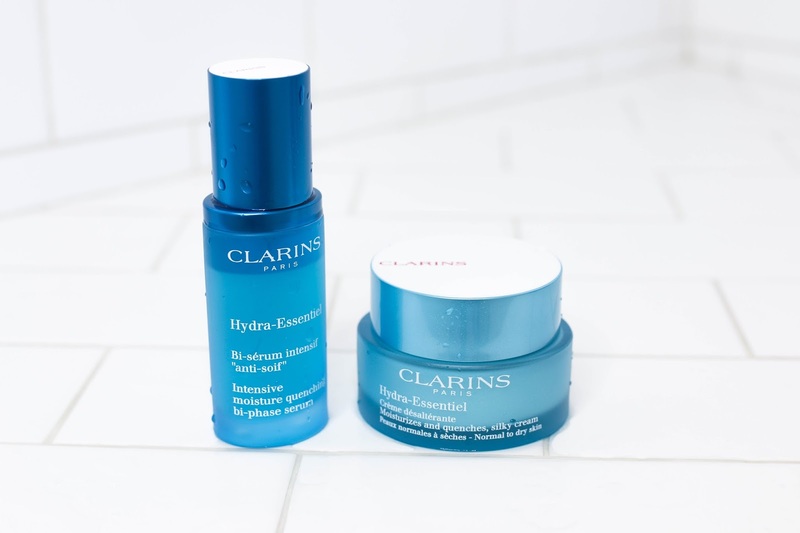 Clarins Hydra-Essentiel Intensive Moisture Quenching Bi-Phase Serum - While the moisturizer helps to both hydrate and comfort the skin, this bi-phase serum is all about hydration - all day hydration. Serious hydration. 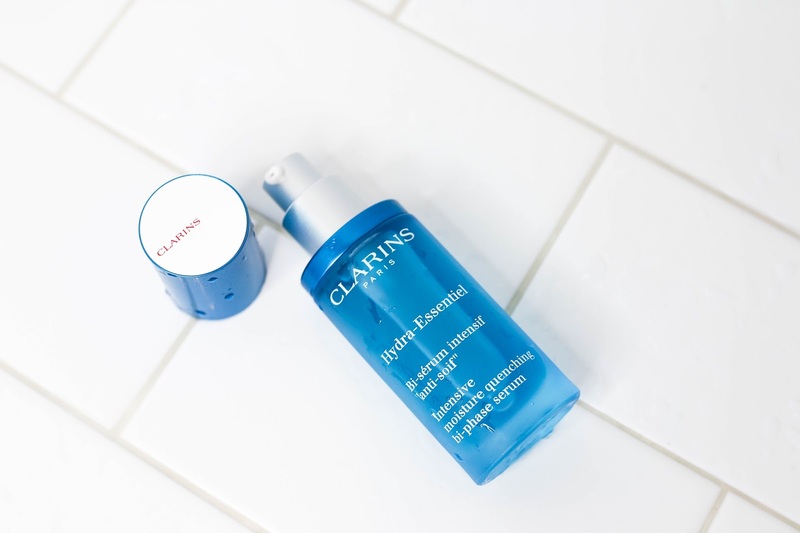 The texture is a watery liquid that plumps the skin up with moisture immediately, and after using it for a few weeks, my skin even looks a bit more radiant (however that is always a side effect of really great hydrating products #hydrationiskey). Because it is so lightweight, I find it easy to layer under other serums and/or moisturizers if my skin is in need of additional moisture. I enjoy the moisturizer in the evening, however the serum has been best for me in the morning. Since I wear makeup everyday, I rely on skincare that can give me long lasting hydration so my makeup doesn't end up looking cakey by the end of the day. Another side effect of too little moisture in my skin is I end up getting very oily which can ultimately lead to breakouts. So in summation - all roads lead back to hydration. It's the foundation of my skincare routines and one of the results I seek the most because it solves almost all my skin concerns. If you are in the market for a new serum or moisturizer to help with dehydration, I highly recommend giving either a try. They work well together as well as with other skincare products so they are easily added into a routine. 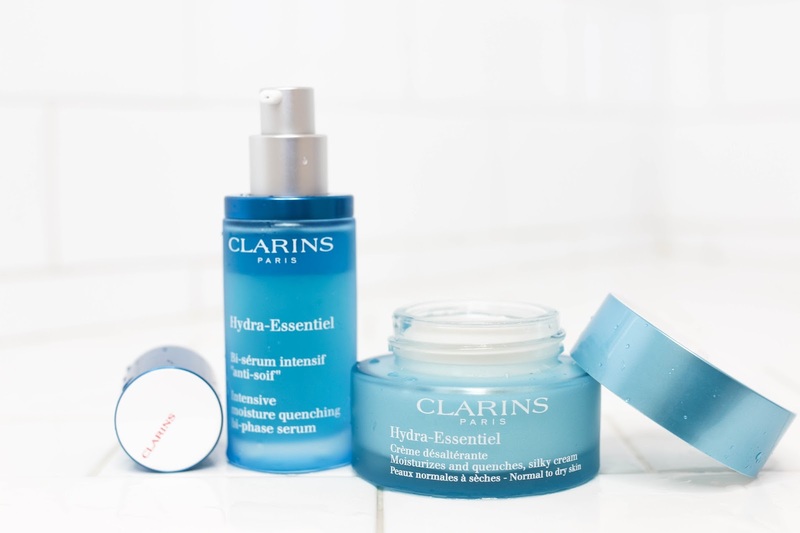 This post is sponsored by Clarins. However, my review and feedback reflect my honest experience with the products and the results I received using them.